Have you thought about utilizing this summer as an opportunity to get your family prepared for the next disaster? You can get your whole family involved while the kids are home this summer. Why don’t you start by implementing some family preparedness games into your children’s playing regime? FEMA’s Ready.gov has quite a few game options to choose from. I personally really like Pack It Up, a disaster preparedness spin on the classic matching game. 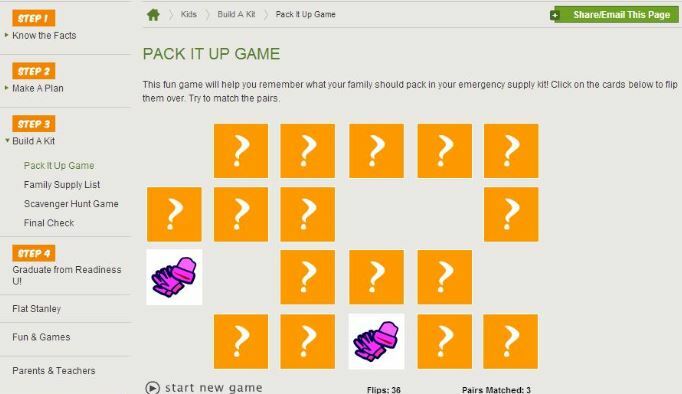 Screen capture of the Pack It Up game from Ready.gov. Take a look around the Ready.gov site. Not only do they have my favorite matching game, but also scavenger hunts, crosswords, coloring pages, and so much more. Making disaster preparedness fun will encourage your children to take action. Work as a family to get a kit, make a plan, be informed, and get involved! Make this the summer your family becomes prepared for anything.